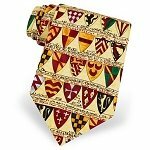 A fine yet fun selection of fine 100 % silk ties with themes centered around the UK. 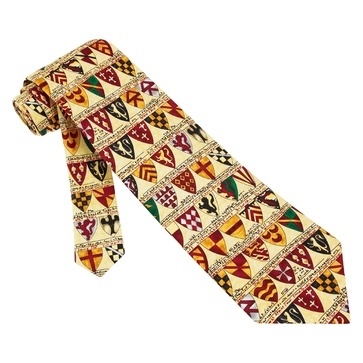 The only problem I am having is keeping my hands off them when looking in my closet for a tie for a special occasion. 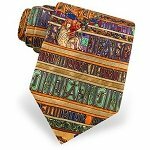 The new ties we get in are far more interesting than my old. I shall have to ask Santa to bring me a few in my stocking. 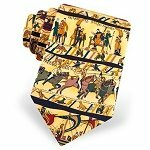 Our Bayeux Tie reproduces just a few of the hundreds of historical images memorialized in the original Bayeux Tapestry, a work of embroidery 230 feet long and 20 inches wide. The tapestry is made up of a myriad of images, divided into scenes of a particular event, and then joined in linear sequence to enable the then mostly illiterate population to read the entire story of the events which led to William the Conqueror's invasion and conquest of Anglo Saxon England in 1066. William was subsequently crowned as King of England on Christmas Day, 1066. 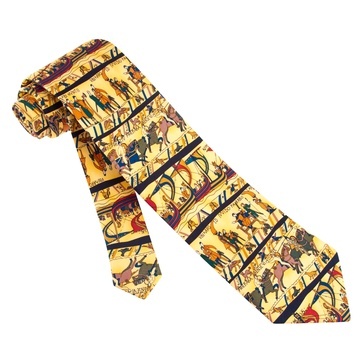 This yellow necktie is made with silk. 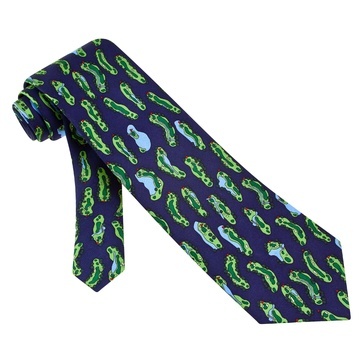 This golf tie features repeating golf courses on a dark blue background. This tie is constructed of fine silk and features a matte finish. 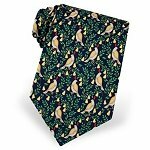 Birdie's Eye View is a tie for men that enjoy golf and wouldn't mind a conversation-starter for the clubhouse. It also goes great with green jackets, so please keep practicing. The Book of Kells, described as 'the most beautiful book in the world', dates from the eighth or ninth century. The book was named for its home, Kells in County Meath near Dublin, Ireland and was created in the scriptorium of the monastery of the Collum Cillae order. 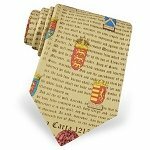 This mens tie reproduces in exquisite detail a segment of the intricate and creative text and imagery on 100% silk off white necktie. 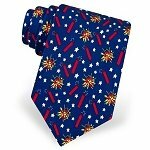 Our star-spangled tie will liven up your Independence Day celebrations. 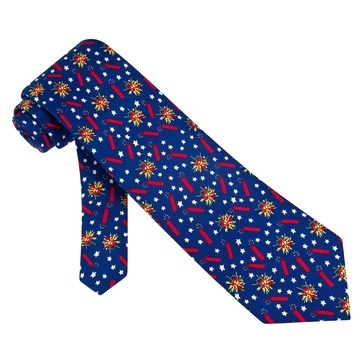 This chic tie features bursting firecrackers on a star-spangled blue background. Each necktie is constructed of fine silk and we inspect all of our neckties by hand three times before they can be cleared for shipping. It makes a great Father’s Day gift for an exceptionally American dad. The first known use of armor was by the Egyptians (1500 B.C.) The armor was a cloth, shirt like garment overlapped with bronze scales or plates sewn to it. The armor was very heavy, causing this style of protection to be short-lived. 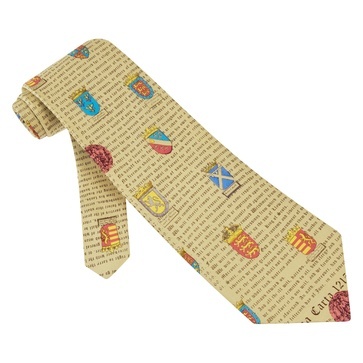 This 100 % silk necktie features heraldic shields on a yellow background. 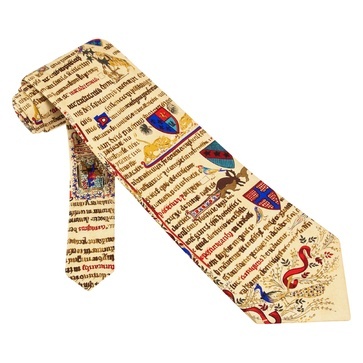 Our classic Illuminated Manuscript men's necktie is constructed of the finest silk fibers and hand crafted construction. 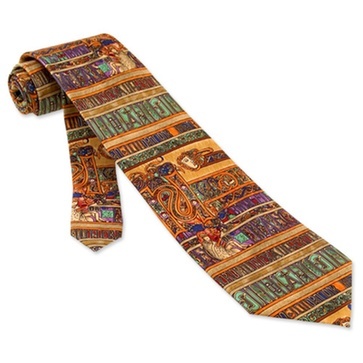 This design is vibrant in color and has a silk twill texture with a matte finish. A perfect gift for that special someone. 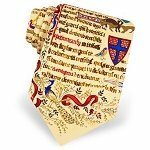 f you are a history buff and love wearing a necktie, then have the best of both world's with the Magna Carta men's necktie. Featured on a matte finish, you'll find portions of the Magna Carta displayed against a parchment yellow background. 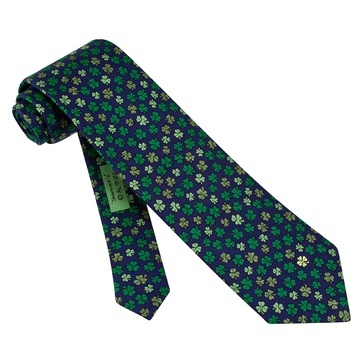 The silk construction of this necktie is beautiful, so treat yourself today! 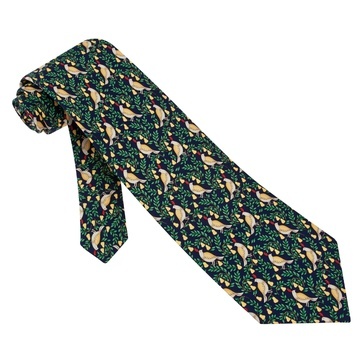 This 100% silk necktie features the classic Partridge in a Pear Tree against a navy blue background. Make sure you don't get pinched this St. Patrick's Day. 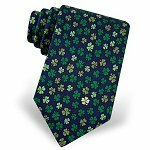 Our shamrock'd tie has just the right amount of green to show your Irish pride and will give you the Luck of the Irish with the hidden four leaf clover. You could wear it any ol' day you need a little extra luck.